What stands in the way of peaceful coexistence between Russians in the peninsula and the only group that actively resisted its reintegration with Russia? The events of the last few months in Ukraine have overshadowed all other primary topics on the international agenda. And there is a good reason for this. A precedent for the transfer of a part of one former USSR republic into the jurisdiction of another was established in March 2014 for the first time since the collapse of the Soviet Union. The controversy around Crimea has become the sharpest confrontation between Russia and the West since the end of the Cold War. Furthermore, the Ukrainian crisis did not end after the change of the peninsula’s status. At the same time, the events of recent months have several other important aspects, in addition to the geopolitical context. The issue of the Crimean Tatars can be considered as being among the most significant. At the same time, Crimean Tatar activists have refrained from any direct confrontations with Moscow. What difficulties are there in the way of Russians and Crimean Tatars on their path towards integration and living together? The Crimean Tatars are a Turkic ethnic group that was formed in Crimea in the 13th – 17th centuries when the peninsula was ruled by first the Golden Horde and then the Ottoman Empire. Today there are is much speculation about the kinship of the Crimean Tatars and the Tatars living in Russia. 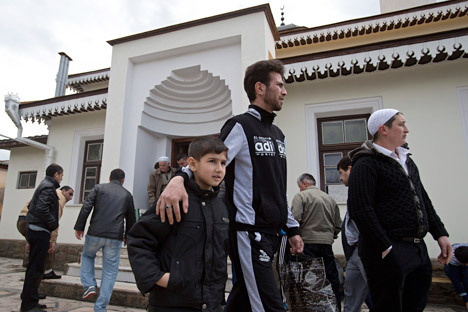 Crimean Tatars themselves identify themselves as “qırımlar” (or Crimeans). According to the Secretary of the Spiritual Administration of Muslims of Crimea Eider Adzhimambetov, Crimean Tatars and the Tatars of Russia are “fraternal peoples with a common history. But they are different peoples”. Indeed, while the Tatar khanates, located on land which is now part of modern Russia, came under the control of Moscow in 1552 and in 1556, respectively, the Crimean Khanate existed separately in the period 1441-1783, and was a vassal of the Ottoman Empire for most of its history. After the Manifesto of Empress Catherine II (the Great) of April 8, 1783, the Crimean Khanate was liquidated, and the Russian period began for the Crimeans. A significant part of the Crimean Tatars moved to the Ottoman Empire in the 1790-1850s. In the 1920-1930s, the Soviet government did a lot for the development of the national culture of the Crimean Tatars. The Crimean Autonomous Republic was established as a part of the Russian Soviet Federated Socialist Republic, and two languages became official there: Russian and Crimean Tatar. The development of schools and printing in the Crimean Tatar language was encouraged, but in 1937, during the “Great Terror”, many representatives of the national intelligentsia were repressed. In May 1944, by order of Stalin, the whole population of Crimean Tatars was deported from the peninsula along with some other peoples of Crimea (Greeks, Bulgarians, and Armenians) and sent to far-flung parts of the USSR, accused of being Nazi collaborators. This event was an important milestone in their history. Firstly, it “consolidated the ethnos”. Secondly, it strengthened the Crimean Tatars’ phobias in respect to Russia, which have been preserved until today. These are the reasons for the group’s fears about becoming a part of the Russian Federation - especially given the fact that, unlike other punished peoples, the Crimean Tatars were not returned to their homeland during the Khrushchev Thaw. This was the reason for their long struggle for repatriation, which was successful only at the end of the perestroika period. However, there are some nuances here. Many experts tend to consider the Crimean Tatar community as a monolith and almost as a vertically aligned political force. However, this is not so. Yes, the Mejlis (the representative council for the Crimean Tatars) is the group’s most powerful organization today. However, not all Crimean Tatars consider it the only voice of their national interests. Before his murder in the 1990s, Crimean Tatar leader Yuri Osmanov tried to create an alternative to the Mejlis. Unlike his opponents, he spoke in favor of a wide development of relations with Russia. In 2006, a group of Crimean Tatar activists established an organization called the Milli Firka (People's Party). In 2014, its leader Vasvi Abduraimov supported the March referendum, positioning himself as a supporter of Eurasian integration and an opponent of the new government in Kiev. Today, “the problem of the Crimean Tatars” consists of several problem areas: the land issue, the representation of the Crimean Tatars in government, relations with Ukraine, and finally the issue of building the state and confessional relations. All these topics can be resolved positively, if the parties so wish. However, they require nontrivial solutions, pragmatism and compromise from all participants. If the decisions are based on pragmatism rather than on maximalism, then there is a chance to make Russian Crimea a model of interethnic and interreligious harmony. Sergei Markedonov is Associate Professor in the Department for Foreign Regional Studies and Foreign Policy of the Russian State University for the Humanities. This material was prepared with the assistance of Andrei Raskin.